FC Barcelona, playing without the vast majority of its stars, cruised to a 3–0 win at third-tier Murcia in the first leg of the Copa del Rey last 32 on Tuesday night. Paco Alcácer gave Barça the lead moments before halftime, and Gerard Deulofeu and José Arnáiz added insurance in the second half, handing Barça a sizable aggregate advantage heading into the return leg at Camp Nou—to be held in late November—and practically guaranteeing a berth in the last 16. It was just the kind of game first-year manager Ernesto Valverde was looking for. "We're happy because it's a good result," he said. "On top of that, [two] Barça B players made their debuts and others who haven't had a lot of minutes got a chance to play." Goalkeeper Jasper Cillessen, making his first appearance of the regular season, made three saves to turn in a clean sheet. Barça, the three-time defending Copa del Rey champions, is attempting to become the first club to win the 83-team tournament four straight times since 1933. The victory also keeps FC Barcelona undefeated on the season, including eight wins and a draw in nine La Liga games and a perfect three-for-three in the UEFA Champions League group stage. Their overall record now stands at 12-1-0. With Murcia just seconds away from taking a scoreless deadlock into the intermission, Alcácer nodded Deulofeu’s cross past Murcia goalkeeper Alejandro Santomé to give Barça a 1-0 lead. The 44th minute goal was a painful blow to Murcia, which had managed to hold the top-ranked team in La Liga in check for most of the first half. Deulofeu made it 2–0 in the 52nd, expertly dribbling through three defenders in the Murcia penalty area before slipping the ball from a tight angle past the sliding Santomé. In the 56th, Arnáiz, the Barça B forward, making his first team debut, sized one up from the edge of the Murcia area, pulled the trigger, and blasted the shot past Santomé. "Arnáiz is a good one-on-one player, he's always looking to score, and I think in the future he can help us out," Valverde said. Up against a third-tier side, most of FC Barcelona’s bona fide stars—like Leo Messi, Luis Suárez, Andrés Iniesta, Samuel Umtiti, Sergio Busquets, and Marc-André ter Stegen—did not even make the trip. And the three most used this season among those who did travel south—Gerard Piqué, Ivan Rakitic and Sergi Roberto—did not even start. Rakitic and Roberto both came on as subs in the 76th minute. 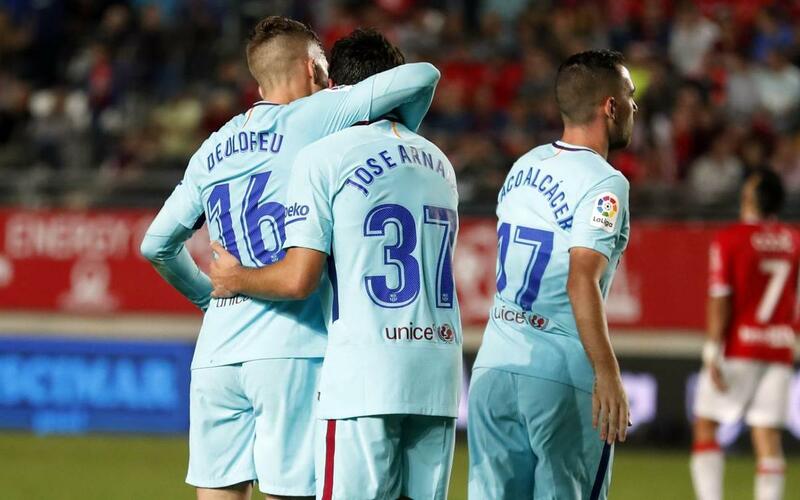 But despite the amount of star power relegated to the sidelines, Barça dominated play in the first half, winning the battle for possession, 75%-25%; outshooting Murcia, 4-2; and winning 9 corner kicks to Murcia’s 0. Nevertheless, for all of Murcia’s statistical deficiencies, it had managed to effectively fend off the Catalans and appeared poised to head into the intermission engaged in a scoreless deadlock. Barça, however, had other ideas.